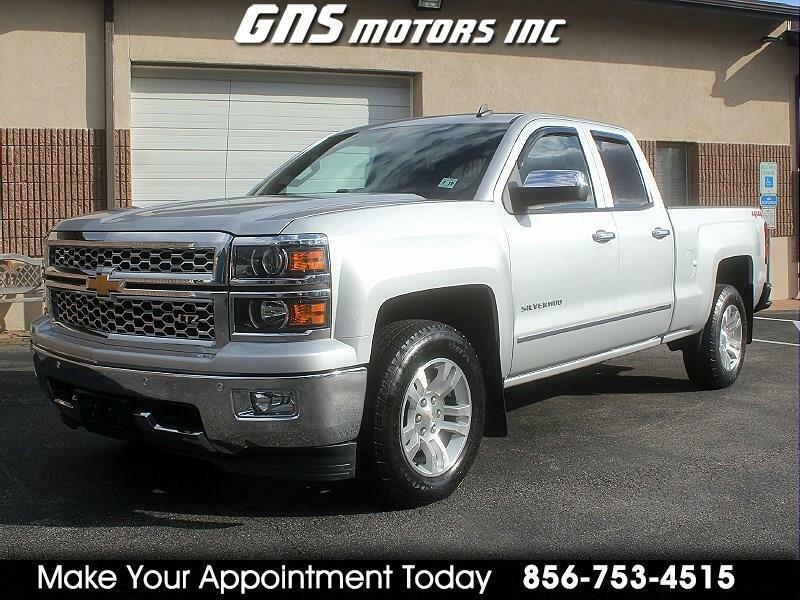 Used 2014 Chevrolet Silverado 1500 4WD Double Cab 143.5" LTZ w/1LZ for Sale in West Berlin NJ 08091 GNS Motors Inc. THIS 2014 CHEVY SILVERADO LTZ 1500 4 DR EXT CAB 6.2L IS IN EXCELLENT CONDITION!! CHECK IT OUT ON YOU TUBE https://youtu.be/E9gqxWxY9vU * IT IS LOADED WITH ALL POWER * NAVIGATION & BACKUP CAMERA * HEATED LEATHER SEATS * HEATED STEERING WHEEL * BOSE AM/FM/SAT STEREO WITH CD PLAYER AND SD CARD READER * MULTIPLE USB PORTS * BLUETOOTH * DUAL CLIMATE CONTROL * POWER ADJUSTING PEDALS * FACTORY AC INVERTER * FRONT AND REAR PARKING SENSORS * POWER SLIDING REAR WINDOW WITH REAR DEFROSTER * FOG LIGHTS * CRUISE CONTROL * ONSTAR * TILT WHEEL * TRACTION CONTROL * FOLDING REAR BENCH SEAT * KEYLESS ENTRY ALARM WITH FACTORY REMOTE START * BED LINER * TOW PACKAGE WITH FACTORY TRAILER BRAKE CONTROLLER * NEW BRAKES!! 25 YEARS IN BUSINESS WE PRIDE OURSELVES ON NO HIDDEN AND A FEE'S NO PRESSURE ENVIRONMENT!! 146,700 HIGHWAY MILES, MUST SEE!! WE NOW OFFER AS LOW AS 3.99% FINANCING!! .. ALL CARS COME WITH A FREE CARFAX .. WARRANTIES ARE AVAILABLE ON MOST VEHICLES .. PLEASE CALL .. 856-753-4515 .. TO MAKE AN APPOINTMENT TO COME SEE AND DRIVE .. OUR VEHICLES ARE KEPT IN OUR INDOOR SHOWROOM SO AN APPOINTMENT IS NECESSARY .. FOR MORE PICTURES AND TO VIEW OUR INVENTORY ONLINE GO TO... WWW.GNSMOTORS.COM ..